Learn all about how social commerce platform Like2Buy drives traffic and revenue to your site through your business's Instagram account! If you’re a marketer or social media manager, chances are you’re constantly faced with the challenge of connecting social media with ROI and defending the value of investing in social media platforms like Instagram. However, what used to be an endless feed of photos transformed into a world full of limitless ROI opportunity for businesses. With Instagram having over 300 million monthly active users worldwide and 70 billion photos and videos posted each day, many marketers have their eyes fixed on the social media platform to see how they can capitalize off of it. While there is plenty of engagement occurring on Instagram, without the ability to attach links (besides in the account bio), there was no way to drive users from Instagram to make purchases—that is, until Curalate found a way. Curalate developed and introduced Like2Buy in August 2014 to help take Instagram’s active users and drive them to make purchases. 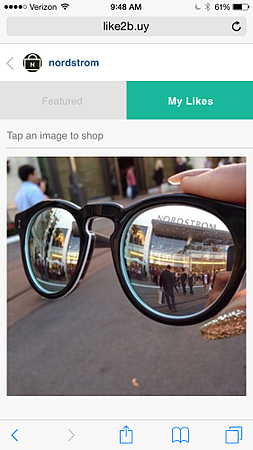 Like2Buy really is, as they say on their website, Instagram’s missing link between traffic and revenue. Like2Buy is almost exactly like what it sounds like; it allows your followers to like your product images on Instagram to purchase them. Like2Buy allows followers to like photos featuring a business’s products, and then gives them the opportunity to go to that business’s Like2Buy page to purchase those exact products immediately or save them for later. To give you a better understanding of how it works, here is a walkthrough of one of my favorite companies taking advantage of Like2Buy and executing it well for their consumers—Nordstrom. 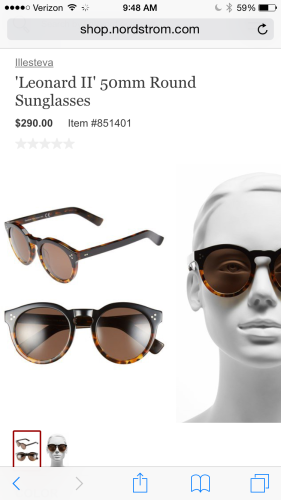 When someone swipes through Nordstrom’s Instagram feed and sees a post from featuring one of their products—let’s say the Leonard II 500 Round sunglasses (an item I’ve had my eye on recently)—all they have to do is like it and go to Nordstrom’s Like2Buy page in the link of their Instagram bio page. From there, it will take you to Nordstrom’s Like2Buy page in Safari. A Like2Buy page is made up of two columns: one showing all of their Instagram posts with featured items they are selling, and ‘My Likes’ which shows all of Nordstrom’s posts that you have liked. If you are new to Like2Buy the ‘My Likes’ tab will ask for permission to access your Instagram. Once you have granted them permission to access your account, it will show you products you have liked from Nordstrom. 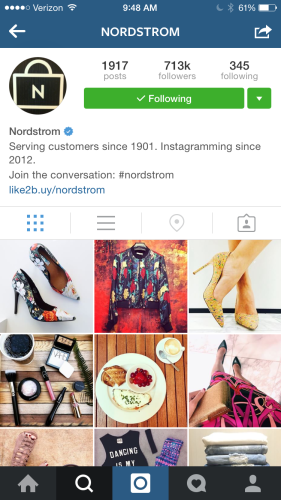 If you’re not interested and want to return to your Instagram feed, simply click the Nordstrom Instagram profile picture to go back. From there, all you have to do is tap to purchase and it will immediately take you to that item listed on Nordstrom’s mobile responsive site! Clearly measure ROI – With Like2Buy, marketers can help drive traffic and sales from Instagram—making it crystal clear that a great deal of ROI comes from their Instagram account. Personalization – Like2Buy is also customized to fit any brand’s aesthetic. Although this new technology is only being tested by a few big brands, some businesses, like Charlotte Russe, have seen an immediate, direct benefit with a 60% click-through rate from their Like2Buy pages. 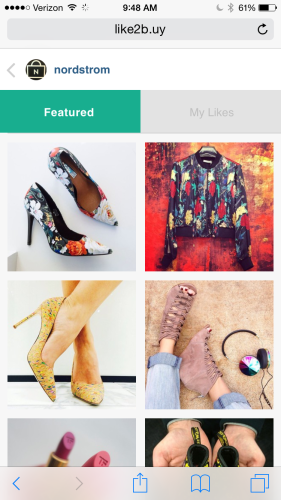 While we have seen several similar products, like LIKEtoKNOW.it by rewardStyle and #InstaKors by Michael Kors, we’re partial to Like2Buy for its smooth integration and customization. Overall social commerce is still a work in progress across social media platforms, but this Groover believes Curalate is really on to something here. This could force brands to innovate and literally keep up with the Kardashians, making for a truly interesting ride in 2015. Do you know of any other social commerce platforms similar to Like2Buy? Where else do you see social commerce spreading? Share with us in the comments section! If you’re interested in learning about how more about Instagram marketing best practices and how we develop our social media strategies, contact us today! Stay tuned for our next blog on Social Commerce coming soon!